Regulamin strony i RODO (in Polish). owner of the internet domain calculemus.org used to different academic activities. We provide on-line payment by credit cards or by blik - TEMOPARARILY CLOSED (to open this PORT please send an email to: formalized.mathematics@mizar.org). We can send also individual link (address) for the payment. 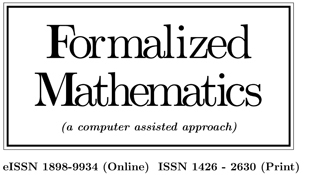 Last modified: January 16, 2019 by Roman Matuszewski (formalized.mathematics@mizar.org).